Join us as we head off the beaten track to discover the extraordinary and varied landscapes of Lanzarote and stunning La Graciosa, the 8th Canary Island. The northernmost of the Canary Islands, Lanzarote is the most surprising island of the archipelago with some truly breathtaking landscapes. It’s a UNESCO Biosphere reserve with over 40% of it being protected; its amazing volcanic landscapes contain some weird and wonderful plants endemic to the island, and some truly stunning beaches. 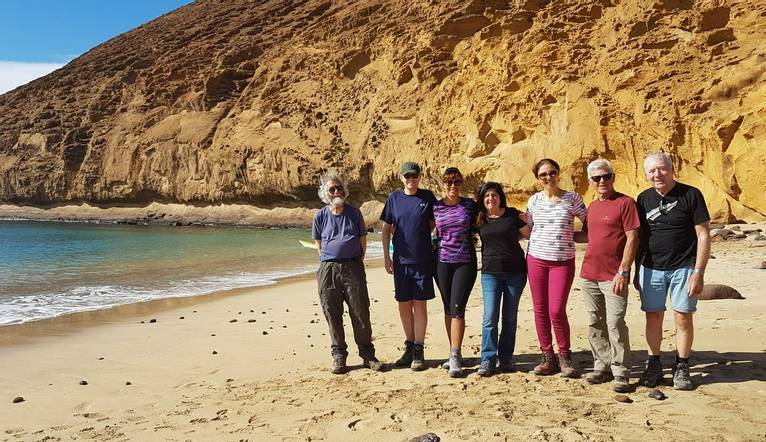 Add to this a superb climate where the temperature rarely falls below 20°C, makes Lanzarote a great choice for some winter walking in the Canarian warmth and sunshine. This walk takes us right into the heart of the island’s volcanic landscapes, where we will witness some incredible landscapes made up of craters, volcanic tubes and channels, and vast seas of lava. The walk ends with a climb up Montaña de Guardilama and a visit to a local vineyard. The volcano of La Corona sits on the uplands of the Famara cliffs from where we can admire glorious views over the Chinijo archipelago on one side and Lanzarote’s stunning north-east coast on the other. The hike begins in the small hamlet of Ye and ascends towards La Corona, walking along a ridge through the mountains, ending in Haria in the beautiful Valley of a Thousand Palm Trees. Gorgeous La Graciosa is known as the Canary Island that time forgot. We take a 30 minute cruise to this unique island where we will walk across dunes, coastal tracks and idyllic beaches. There will also be the opportunity to snorkel in the acquamarine waters (snorkeling gear supplied). Today we walk in the heart of the Ajaches, an ancient range of volcanoes from where Lanzarote initially emerged. We begin in the small hamlet of Femes with a visit to a local cheese factory, before we take a beautiful descent to the Pico Redondo. We continue to the coast through amazing arid canyons finally arriving at the beautiful beaches of Papagayo. This friendly hotel’s facilities include a swimming pool and sun terrace with panoramic views, restaurant, piano bar and fitness centre. Room facilities include telephone, air-conditioning, mini-bar, free Wi-Fi, safe, TV and hairdryer. Hotel Lancelot is located just metres from the sandy Reducto Beach in Arrecife. This is a welcoming, conveniently-located hotel with friendly staff and great on-site facilities. This beachside property is a fantastic base for your activity holiday in Lanzarote. The transfer time from Lanzarote Airport to the hotel is approximately 20 minutes, depending on weather and traffic. Four guided walks are included in the programme. Your walking guide will advise you in resort of the daily programme. The walking programme is graded as Easy to Medium and you can expect to walk between 8 to 14km per day, with some ascents/descents, rough underfoot terrain and high altitudes involved. Below are the distances for each walk, however please bear in mind these are approximate and subject to change due to local conditions. It is of paramount importance that you have the correct footwear. It is essential to wear walking boots that are comfortable and preferably lightweight, with some ankle support and a good grip. If you already have a pair of boots that you are happy walking in (including during hot/wet weather and on hard ground), then bring these along. Experience has shown that wearing 2 pairs of woollen socks adds to comfort. We suggest a Group Collection to cover transfer drivers, and hotel staff of €20.00 per person. Your Tour Leader will collect this on your behalf and distribute it accordingly, thus relieving you of the burden of who, when and how much to tip. The tipping of housekeeping will be left to your individual discretion (a small amount left in your room on departure should cover this and would be much appreciated). As is customary, ‘the hat’ will be passed around for the driver and guide on all optional excursions. For any meals that are not included in your itinerary, or taxi fares, your Tour Leader can advise of an appropriate % to add on.